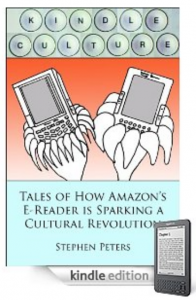 Stephen Peters, a longtime popular culture writer, has a book called Kindle Culture that I think is worth reading. It is a quick read, and has a lighthearted, easygoing writing style. It is interesting to read how the Kindle has changed lives. I was particularly intrigued with the story about how one woman was able to read for the first time in 10 years. The Kindle has done wonders for people with print disabilities, and is much more cost effective than standard assistive technology. I can attest that as a visually impaired Kindle user, the font size adjustments have been a lifesaver. The Kindle has impacted many aspects of peoples’ lives from increased portability to profitable business ventures. Many individuals and companies have created covers, accessories, and now applications for the Kindle. You will also find a number of forums and blogs that united Kindle lovers from various backgrounds around the world. I like this reviewer’s point about how it is neat to see the concrete effects that the Kindle has had on people. I admit that this book is kind of dated. It was published in 2009, but I think it is still relevant because it shows the impact that the e-reader has made in just two short years since release. One of the “questions” that the Amazon (NASDAQ: AMZN) description of Kindle Culture brings up is the effect that the “kindle killers” will have on the e-reading device. Two years since this book’s release, the Kindle is still the best selling e-reader. So it has definitely held its own among all of the Nooks, iPads, Kobo, Sony e-readers, and other e-readers that are out there. In theory, Peters could rewrite Kindle Culture about every couple of years due to the rapid changing pace of e-reader technology and competition. The “Kindle Culture” has grown exponentially since this book was written through the price drops, e-reader market competition, upcoming Library Lending program, Kindle applications and many more. This entry was posted in Good Kindle Books At A Glance, Kindle Thoughts and tagged iPad, kindle culture, Kobo, Nook, popular culture, Sony, stephen peters by holly. Bookmark the permalink. Thanks for the tip. I bought the book (it’s $4.95) and enjoyed it. It looks to me as though he isn’t going to–from his author description he’s someone who’s most interested in “breaking news.” I suggest that a good alternative would be for an anthologist (you?) to collect the best blogger-threads of recent years and make them chapters in a Kindle book–or books. (With royalties going to the authors, of course.) There’s room for more than one, focused on different aspects of the topic. I’d like to point out that this book is 2 years old (written in 2009) and much of the information in it is out of date. I also found it poorly organized and thinner of content than I’d expect for the price. I got about 1/3 of the way in and returned it.